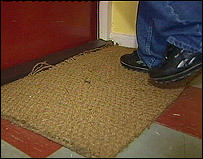 A ban on doormats in the corridors of council-owned flats in Bristol for "health and safety" reasons has been overturned by council bosses. It follows protests from residents taken up by local councillor Derek Pickup who spoke with housing officers. Mr Pickup said he was sure tenants would be "delighted" with the news. A Bristol City Council spokeswoman said the ruling would now apply to sheltered housing and other blocks with elderly people where the trip risk was higher. She added: "Our primary concern is for the well-being of our tenants. A number of tenants contacted us asking if they could keep a mat outside their front door. "We have therefore reviewed the request to remove doormats, and decided it will only apply to tenants living in sheltered housing schemes and other blocks allocated to older people where the risk of tripping is much higher." Mr Pickup argued council bosses were trying to look after the safety of tenants by banning doormats in communal corridors which could present a "tripping hazard" but tenants had protested to the council and it had listened. "Whenever health and safety regulations are applied there does need to be some kind of balance - and now I believe that balance has been restored. "The very fact that tenants have doormats is an indication of the pride they take in their own homes and this should surely be encouraged," he said. The letter originally went out to residents of Brookridge and Barlands flats in Henbury and would have then been sent to 14,000 council flat tenants across the city. The news comes a day after it was revealed Bristol City Council paid £115,000 in compensation to a teacher who tripped on loose carpeting.